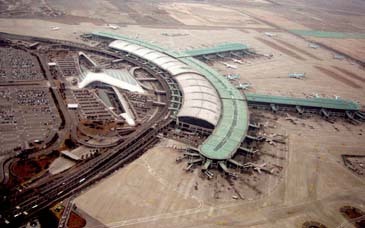 An aerial view of Incheon International Airport. Incheon International Airport won Top Service Quality Awards 2007 given by Airports Council International (ACI) on Feb. 25 for the third year in a row. Geneva-based ACI has announced the top performing airports in the Airport Service Quality Survey. The ASQ rankings are based on the results from nearly 200,000 questionnaires completed by passengers in 2007. The survey captures the passenger's immediate appraisal of 34 airport service factors, from check-in through to departure at the gate. For the third year in a row, Asia Pacific airports garnered the three top positions in the ‘worldwide category, with Incheon International Airport coming in first, Kuala Lumpur International Airport second and Singapore Changi in third place. The official awards ceremony will be held 1 April at a gala dinner which will be held at the two-day ACI conference on customer service and facilitation in Shanghai this year. Programme director Craig Bradbrook comments, Service quality should never be viewed as a ‘nice to have feature in managing airport services, but as a key discipline in the airport management process. We see a high correlation between management commitment to service and passenger satisfaction. Commenting on the Asia Pacific performance sweep, Bradbrook explains, "At Incheon, the management team takes pride in delivering quality airport service and sees it as being part of the overall tourism value chain – good for their airport and their nation. That means that the commitment is given very high priority politically as well as operationally by the airport. "In Kuala Lumpur, the management team has pursued a ‘world class service' objective firmly supported by a strategy that puts service quality first and that has dovetailed with Malaysia's "Visit Malaysia 2007" tourism campaign. "And the third place winner Singapore has pursued a determined objective for 20 years, working hard to build a reputation that has become synonymous with excellence and regularly introducing new services to better serve their passengers. These are key factors that ensure year on year top performance levels." Each airport faces specific challenges in improving their service delivery, and regional business parameters as well as size can play a role in customer expectations and how airport performance is perceived. That is why ASQ analyses the customer feedback by regional and size categories. Additional categories include "best domestic airport" where Halifax, Austin and Ottawa took top honours this year and "best improvement over previous year" which was awarded to Aberdeen. Three airports — Southampton, Incheon, and Halifax — were given the "airport people award." Each winner has developed a strong customer service culture across the entire airport community, which has been rated by passengers as having the most courteous and helpful airport, airline and security staff. Robert J Aaronson, ACI Director General will present two special recognition awards this year. Mr Wu Nianzu, Chairman of Shanghai Airport Authority, will be recognised for his strong leadership in modernising and expanding the airports under his direction. The Civil Aviation Authority of Singapore and the Singapore Changi airport will be honoured for outstanding leadership in airport business for the past 20 years. Aaronson says, "It is a my privilege to recognise the dedication of forward looking individuals and organisations who are paving the way for airport excellence in times of growth and change. They are models for our industry, and we wish to specially acknowledge their leadership, innovation and commitment to quality in airport service delivery."